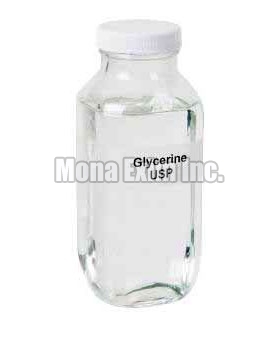 Our company is bracketed with the leading Manufacturers, Exporters and Suppliers of Glycerin USP. Processed with utmost care, our Glycerin USP is known for its quality, purity and efficacy. It is used in paint industries, cosmetic industries and printing ink industries and, pharma industries. Glycerin USP is a humectant used as a moisturizer to treat or prevent dry, rough, scaly, itchy skin and minor skin irritations. We make available Glycerin USP at very pocket-friendly prices.